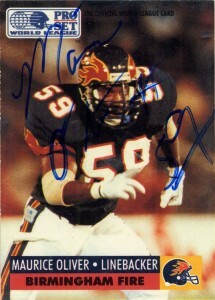 Drafted in the 3rd round of the positional draft by the Birmingham Fire, linebacker Maurice Oliver was overshadowed by his teammates Paul McGowan and John Brantley, but it was Maurice who’d lead the team in sacks out of the gate in 1991 with 7. Originally a developmental squad member of the Tampa Bay Buccaneers, Oliver would suit up for 3 games for them before drawing the WLAF’s attention. Oliver played the 1992 season for the Fire as well where I’d get his autograph after the ending of the San Antonio Riders versus the Birmingham Fire game in which the Riders would win the hard fought contest. In that season he’d grab another 6 sacks, finishing as the franchise leader with 13, – as after the 1992 season the league would suspend operations. After retiring from football Maurice would go into insurance and as of this post is an agent for State Farm (www.mauriceoliver.com) in Alabama.